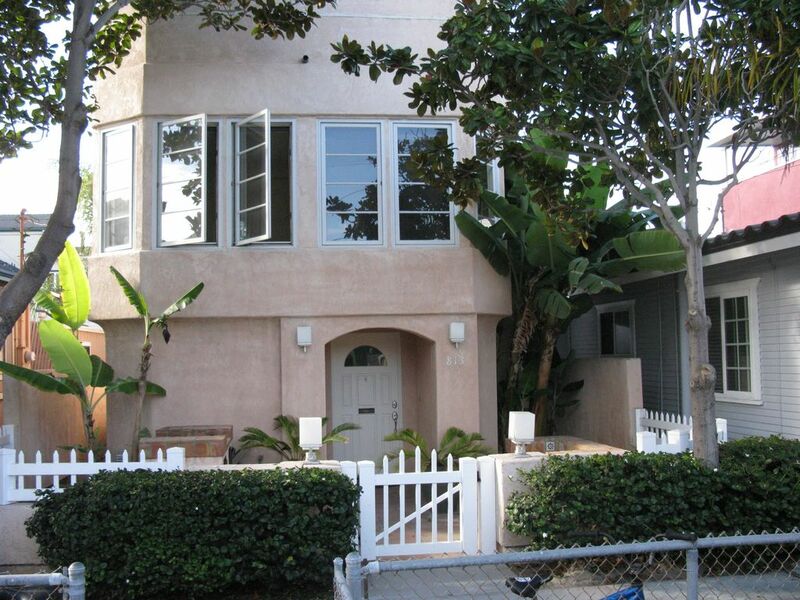 Single Family 3 BR, 2 BA Mission Beach House on Quiet Court-Steps to Blue Sea! Three bedroom two bath house close to beach, Mission Bay and Ocean views. Location, Location Location! (Quote from a guest.) This million dollar plus home is a three story, three bedroom, two bathroom house, (not a condo). Less than a one minute stroll to beautiful beaches on the Pacific Ocean and Mission Bay! Walk to the many terrific restaurants and local bars! You won’t need a car, and if you are driving, a two-car garage with two automatic door openers is part of the house. Save the expense and hassle of renting boogie boards and beach chairs! One of the largest beach houses at 1,242 square feet of living area, not including unique two car plus garage (we suggest requesting square footage of properties before you rent-most properties are small-between 500 and 1,000 square feet). Unique and secure private two car plus garage makes beach parking a breeze. A necessity during the summer as parking is at a premium, if not impossible to find. Comes with two electronic garage door openers. Garage has a vehicle height limit of 6 feet 2 inches. Perfect for three couples or an extended family as each bedroom has a comfortable Queen size bed, cable TV and a private half-bath attached. One bedroom and private half bath on second floor, two bedrooms, two half baths with tub/shower in between on third floor. Allows for a great deal of privacy for multiple guests. Comfortable queen sized beds in all three bedrooms. Master bedroom has balcony with partial Mission Bay and Pacific Ocean views. Ottoman converts to single bed for another guest. LED flat screen TVs in all three bedrooms and living room. Cable TV with more channels than we can count. Excellent location-steps to Mission Bay and Ocean. This is one of the most beautiful beaches in the United States. Mild temperatures, high temperatures average in the 70's, lows in 60's. Over 100 restaurants, bars, and shops within walking and biking distance. One of San Diego's most popular areas for both residents and guests. Short walk to numerous activities, including surfing, sailing, kayaking, deep sea fishing, snorkeling, kids playground and rec center, tennis and basketball court (lit), and amusement park. 12 minutes to airport and Zoo, 7 minutes to SeaWorld and La Jolla. 30 Second walk to public transportation. Numerous golf courses nearby, including Torrey Pines (15 minute drive). Beach chairs and beach towels included. A Pack and Play for toddlers is available. Primary renter must be at least 27 years old. Keywords: Three bedroom, two bath, three story house, private, secure two car plus garage makes beach parking a breeze.This is not a condo! This was my residence for over twelve years. I truly love the central San Diego location, beaches, restaurants, easy access to attractions, downtown, airport, golf and tennis. I felt like I was on a perpetual vacation while living here. You will enjoy the privacy of a free-standing three bedroom home steps to the beach and other amenities previously described. Everything you want is close by-you may never want to get in your car while staying here! No need to rent a vehicle! View of Mission Bay, peek view of the ocean. Over-size two car secure garage. Room for bicycles and toys as well as two cars. (4) Flat screen TVs in all bedrooms and living room with 60+channels. Lighted court a two minute walk away. Several golf courses, including Torrey Pines less than 20 minutes away. A great place to stay. Easy walk to ocean beach in one direction, to bay in the other. Fun area to walk and bike. House was spacious and well equipped, owner very responsive and accommodating. The bikes and boogie boards were a real plus. We really enjoyed staying at this house. I rented it for my family, my parents, and my sister and her husband. It was super close to both the bay and the ocean--easy to walk back for lunch and snacks when the kids were tired. My kids thoroughly enjoyed the "sleeping cave" (very large short closet) upstairs and were very impressed with having TWO fights of stairs. Randall was quick to answer and resolve anything that came up. There were no baby gates for the stairs, so that may be something you need to bring if you have small kids. Also, the house backs up to a family clinic, which turned out to be quite handy. The staff there were very nice too. This house was the perfect location. It allowed us to truly take advantage of all that mission beach and San Diego has to offer. The rooms were good size and comfortable. The kitchen was great for cooking dinner and breakfast. While still allowing us to be at the beach before the rush. Rental shops are down the street and make it easy to plan a half or full day surfing or paddle boarding. This home is comfortable and the true definition of a San Diego beach house. It made our week both relaxing and fun. Thank you Randy. Our extended family of 7 adults really enjoyed staying in this home. We loved the access to both the beach and the bay. The home is in a perfect location to walk to everything - groceries, restaurants, the boardwalk, Belmont Park, which we enjoyed. We kept our 2 cars in the garage except when we took short sight-seeing excursions. The 1 shower is a minor inconvenience, but it worked out fine for us. We appreciated the bikes, boogey boards and beach chairs. The house was adequately furnished and comfortable. The foot bath bucket on the front porch is a useful idea! We enjoyed watching movies and the World Cup soccer on the large tv in the living room. We left some firewood behind after enjoying a sunset fire on the beach. We made great memories and will definitely consider returning. Caution - all the reminders about wearing enough sunscreen are true! My family and my wife's family stayed for a week. We loved the quick access to both Mission Bay and Pacific Ocean. Beaches were clean and the water was great to swim/board in. The house was comfortable, well furnished and had everything we needed, including bikes, boogie boards, beach chairs and beach towels. Really liked TVs in all rooms (kept the kids occupied when not at the beach). We walked everywhere we wanted to go-lots of restaurants and shops nearby. We are looking forward to staying again this summer. As San Diegans who grew up in the area we rented this property to house 6 to 7 adult family members coming from out of town for a family re-union. Location is excellent. The house was very clean, well equipped, and has great parking. The owner is a great guy and made sure everything was ready before we moved in. There was one downside for us; it is not a two and a half bath home, it has three half baths with one shower between the two upstairs half baths. This did make it difficult for that many adults, particularly when coming in from the beach. I am glad you enjoyed the house and location. Thank you for the four star rating. My description states that there are three half baths and a shower/tub in between, total of two full baths in accordance with real estate rules. You add them together to get the correct bathroom count. My previous guests liked the privacy of the three half baths and did not have an issue with one shower/tub, as this is usually occupied briefly. I enjoyed meeting you and your wife and I hope you will stay with us again.